This absolutely stunning beachfront two level corner Penthouse overlooks the magnificent sandy beach, bay and town. The spacious open floor plan features incredible vaulted ceilings, elegant chandeliers and gorgeous indoor dining and living that open to the beautiful covered outdoor terrace overlooking the beach, swaying palms and manicured gardens! The spotless kitchen features peninsula counter, snow white cabinetry and new appliances. Two spacious downstairs bedrooms are havens of restful relaxation that take full advantage of the stunning views and include private bathrooms, spacious closets and separate air conditioning zones.\r\rThe amazing upstairs master suite showcases and incredible private outdoor terrace, vaulted ceilings and "spa-style" bathroom with built-in jetted tub, shower and steam room. Some other features of this beautiful beachfront home include: Staff quarters/fourth bedroom, downstairs powder room and upstairs den/media room. The immaculate complex includes: Secured entry, elegant entry lobby, restaurant, tennis court, covered parking and signature infinity edge beachfront heated pool surrounded by tropical gardens. This beautiful penthouse would make a perfect second home, retirement villa or investment property. 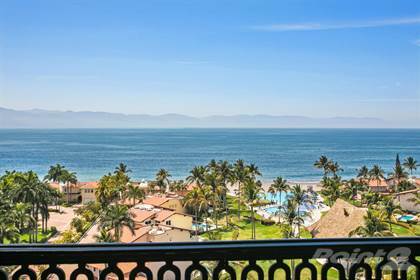 Tastefully furnished and offered "turn-key" ready, this amazing beachfront home is perfect for the most sophisticated and discriminating buyer. Hi, I'd like to find out more information about Caracoles PH8. Thanks so much!